You know those Insta posts that make you stop in your tracks to pin, like and save? The ones you dream about and hope you can incorporate into your day? Those weddings do not just happen to be jaw dropping— a wedding brand was carefully put together to make it a show stopper. 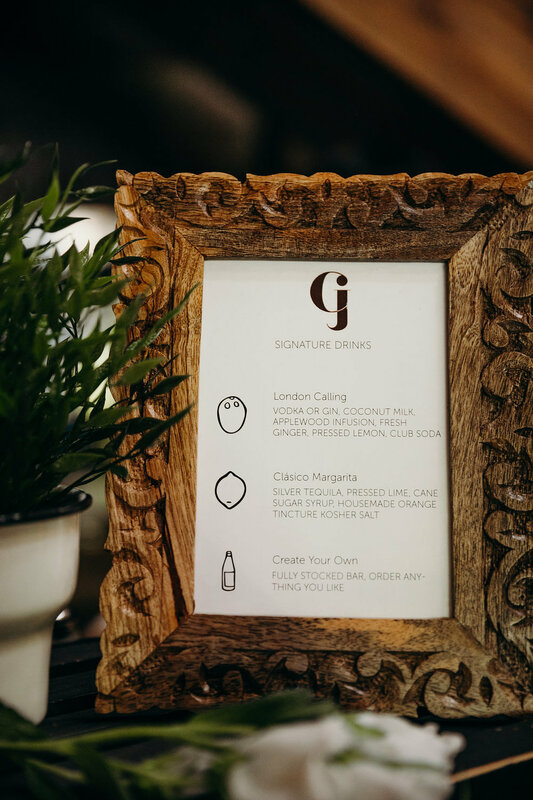 When you thoughtfully design your wedding brand and it’s an authentic representation of your likes and preferences, your guests will feel connected to you and will encounter a positive experience. That’s why you should create a wedding brand. In this post I’m going to explain why you should have a wedding brand and teach you about the major components that make up a wedding brand. Your wedding is special! It’s not to be treated like everyone else’s wedding because you have a love story that is unlike anything anyone else has ever known. So, tell your story! Your wedding brand is the lovely feeling your guests get when they receive your save the date, when they hop on to your website and see the logo they saw on your save the date, when they receive their snail mail invitation, when they get that email with reminders two weeks before the wedding reminding them of the epic festivities about to go down, when they arrive and have a welcome bag in their room for them to enjoy with local goodies. These are all touch points facilitated by your wedding brand and also contain your wedding brand so that it create familiarity. 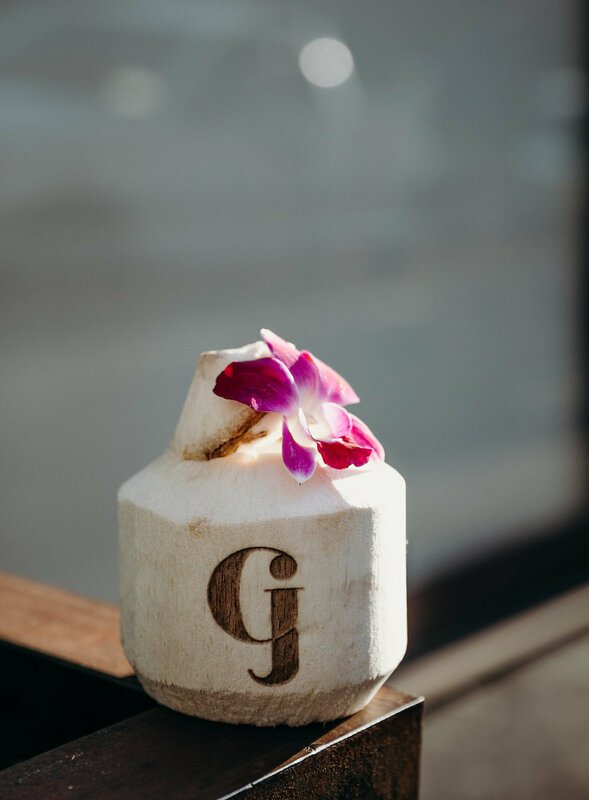 Part of what makes a wedding so great is the special and relatable touches connected to you as the couple. For example, the long standing tradition of sending out stationery is the first touch point for your guests. While sending a generic watercolor stained invitation does the job to inform them, if you’re going to be spending a considerable amount of money on paper, you might as well go that extra mile to personalize it so not only is it informative but it’s meaningful and authentic. Almost like an heirloom that you’re proud of and happy to share with your guests or to share with your future family. Till this day, my invitation hangs in the homes or sits on the tables of the beautiful families and friends I invited to our wedding. Every time I visit a family member they proudly show us our invitation (It was a slab of wood that smelled glorious as we burned our invitation details onto it). My husband and I love the outdoors and the smell of bon fires so that was fitting for us. Creating your wedding brand allows you to fully engage with the touch points your guest experience throughout your wedding journey. From the venue, to the smell of the flowers, to the seating chart and the ushers and the photographers and the place setting, it should all be related and connected. I’ve come across couples where they didn’t think that the investment they made in their celebration was worth the experience of their wedding day. This happens when you “slap” a wedding together or plan a wedding that someone else designed or that you found on Pinterest and copied verbatim. Or they budgeted so stringently they ended up exhausting themselves or forcing themselves to work with vendors that left more to be desired. For one of my clients, we custom created an invitation suite with the Newport Harbor outlined in a stencil style graphic using letterpress and card stock. This was relatable for the client because they grew up in that area and are connected to it by places, friends and experiences. The couple actually had their first date in the area surrounding the Newport setting. What this served as for the guests is a map to the wedding venue because the couple also decided to get married in Newport right next to the harbor. Everything about this was connected in some shape or form to the history and the story of this couple. If you can imagine what it must have been like to be one of the guests that received an invitation with a map of their childhood city where tons of memories were made and adventures were had with the bride or groom. The feelings and the emotions that you get to reminisce on is not something that you can do everyday. My clients struggle a lot with this: to feel like they have a special story. If you dig deep enough and ask yourself the right questions, you’ll discover how incredibly unique you are. 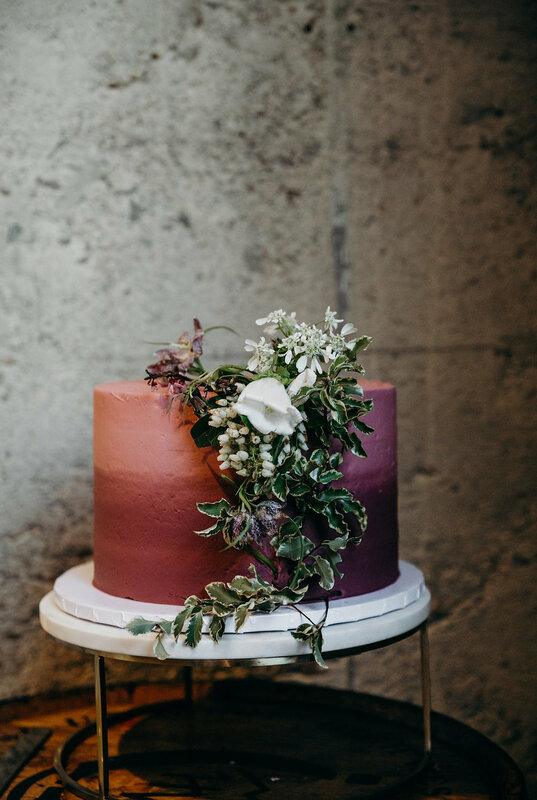 Here are some things to consider when you’re putting together your wedding brand. Color palette - Colors have scientific meanings. For example, green is considered a color that evokes peace and serenity. A logo - Pick a logo that you can easily stamp across multiple mediums. Pick fonts - Pick fonts that speak to your heart and that are legible. Beware with the more elaborate fonts. The more decorative they are, the harder it is to read them. 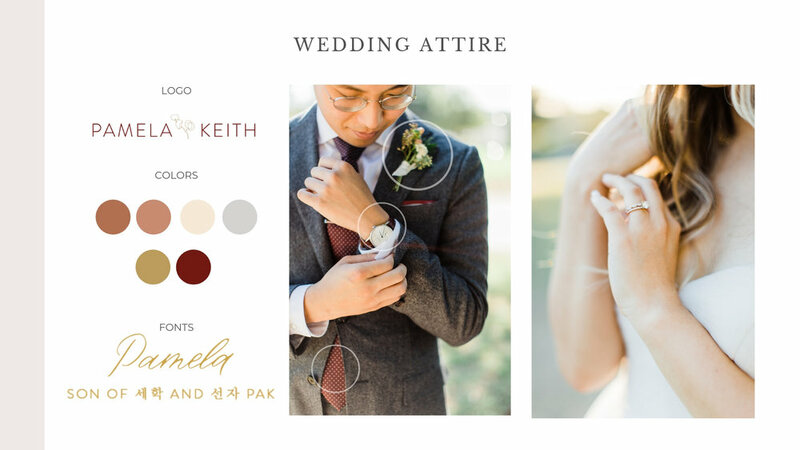 To give you an idea of how this all ties together here is an example of work I’ve designed for my clients and how that translates into expressive touch points throughout the wedding. 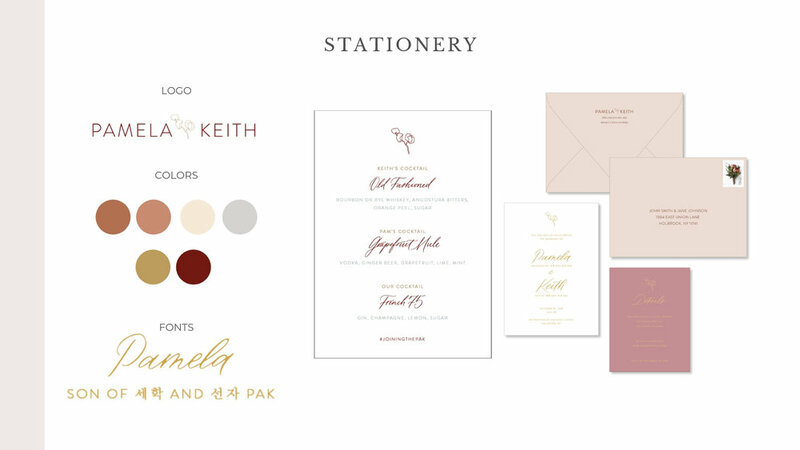 Below you’ll find a logo, a color palette and the fonts that made up P + K’s wedding brand that guided their entire wedding design. You’ll notice that the color palette, logo and fonts were incorporated in each piece of their wedding down to the tie color and bride’s ladies’ dresses. Here are some examples of what you can do with your brand once you have it created. Whatever you end up doing, stick to it. Don’t change or get distracted by the latest trend. Be careful with new ideas and make sure that you’re innovative from the get-go. You’ll never be able to put on such a momentous occasion again so GO BIG! Hire a designer, they will ask you the right questions and show you the best vendors to bring your vision to life. You’re officially ready to develop your wedding brand so your wedding is authentically you from the save the dates to the table settings. If you find yourself in need of designer, we invite to inquire below.